Here it is, gang, The Flash #115. The Magna Carta, the Rosetta Stone, the Book of Kells, the Bayeux Tapestry, the Declaration of Independence, the Dead Sea Scrolls and your truly’s personal epiphany all rolled into one shining masterpiece of a comic book. This book opened my eyes, opened my mind and opened my heart. 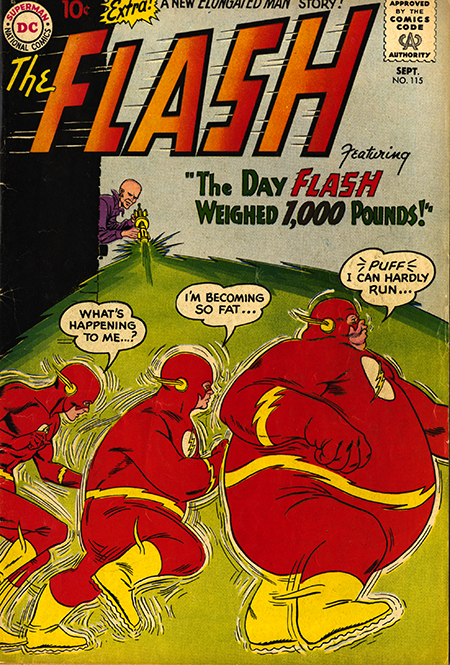 The cover billboards the title “The Day Flash Weighed 1000 Pounds!” and shows a man in a window firing a weapon at the Flash causing him to blimp up to an enormous size. The moment I saw that cover on the comics rack in the Rexall drugstore, that hallowed holy of holies on Brown Street in Akron, I knew I had needed to have it! The second I saw the very first panel of that story I was a goner. The caption read: “In a triple-reinforced glass prison in Gorilla-City, secret stronghold of an ultra-scientific civilization in deepest Africa…” Wow! We see all of that in the drawing, the gorilla in a glass cage, the jungle, and in the distance a futuristic city… and the gorilla is thinking: “Every time my nemesis the Flash succeeded in putting me in prison, I managed to escape*…” So the Flash has fought this really cool villain before! But when? The question is answered in the footnote: “*Editor’s note: the previous clashes between the evil gorilla Grodd and Flash appeared in issue 106, 107, 108 of this magazine!” What!? And I missed them!? Back in those pre comic shop-pre comic con-pre ebay-pre archive edition days, when you missed a comic it was lost to history! Gone! Forever! And I missed them! Let’s bow our heads for a moment to contemplate those lamentably lost issues. Okay, skipping ahead for a sec… after finishing the issue I vowed never to miss another. So I decided to get a subscription which required me sending $1.20 to DC Comics by mail. Not wanting to trust such a sum to the pettifoggers and ne’er-do-wells of the world, I gave my dad the money and asked him to write me a check. Doing his parental due diligence, my father read the book and said he’d write the check but he didn’t think the book was worth it. I felt sorry for him… he obviously didn’t have a clue. Apparently he thought that by reading books like this I would be lured from the righteous path to the dens of inequity… okay, well that part he had right. In part two, we’ll explore just what was in that brain busting book.